Grande Tile. The panels are for use on residential and light commercial roofs, and mansards. Single course panels have an exposure height of 13.75”. Double course panels have an exposure height of 27.75”. Panels can be cut to length, and the maximum panel length is 19’. 41” Weight /Square: 67 lbs. The scope of the work includes, but is not limited to, the installation of all panels, pre-formed accessories and field-formed accessories such as various flashings and attaching devices as well as sealant. All panels, including, pre- formed accessories and flashings and matching coilstock are made of .032” 3105 H24 aluminum alloy sheet stock with a yield strength of 26,400 psi. and a tensile strength on 27,700 psi. Grande Tile panels are coated with a baked-on protective primer and a Kynar 500® or Hylar 5000® PVDF topcoat to provide a high quality finish. Kynar 500® and Hylar 5000® PVDF resin-based finishes are trade names for polyvinylidene fluoride resin. The backs of the panels are finished with a protective clear coat. Other materials available from the manufacturer include color matching high temperature silicone sealant, underlayment, touch-up paint, pipe flashings and stainless steel screws. Grande Tile panels are designed for installations on roofs with a 3:12 or greater pitch. The panels are applied over minimum 1⁄2” decking. The system may also be applied over existing composition roofing provided the existing roofing is smooth. Any curled or irregular roofing must be removed or replaced. 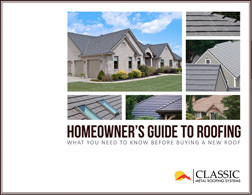 In the case of either a new roofing application or re- roofing, the entire roof must be covered with at least one layer of 30 pound felt underlayment or equivalent. Grande Tile panels install right to left, and lap top over bottom and side over side. Grande Tile panels are held in place with to the deck with #9-15 stainless steel screws with stainless steel bonded seal washers. The screws should be of sufficient length to fully penetrate the decking.